There is a lot of noise induced by the processor and amplified by the input signal of the voice being to low (my educated guess). but that seem to be covered by the input buffers. I reckon an AGC circuit is probably a must to limit the dynamic range as the input is only capable of a fairly limited dynamic range ( assuming 8 bit your talking about only 48dB dynamic range ) but definitely make sure you're close to a maximum of 5 volts peak to peak. Here is an AGC using an lm13700 from the manufacturer's datasheet. It would probably require a low noise preamplifier if using with a microphone as the source. Grumble, have you made any more progress with this? I really think this is a great idea worth developing, hoping you haven't given up on it. No I havent given up. 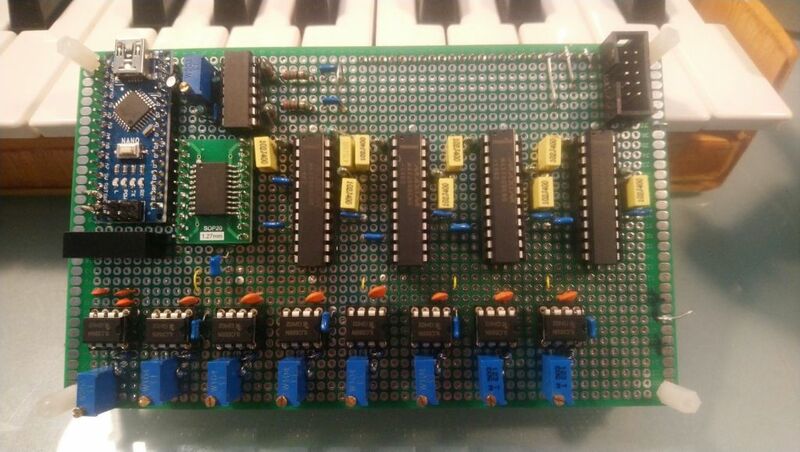 This weekend I added an external 16bit ADC thinking it would give better results with lower amplitudes, but it didn’t. So I guess the next thing is building an extra amplifier to increase the input signal amplitude. 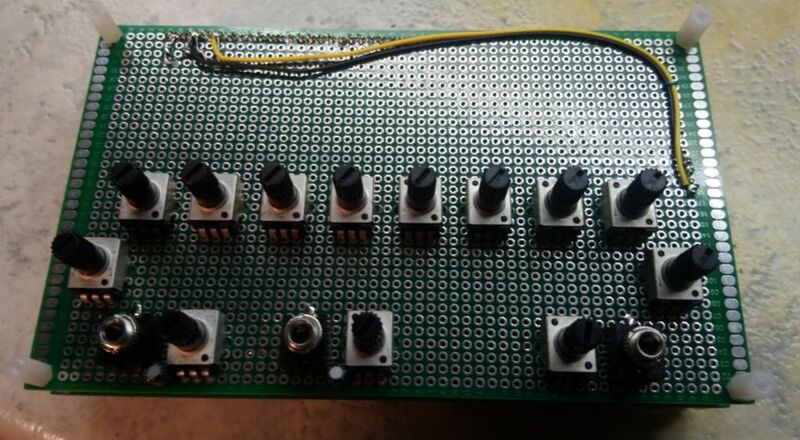 After some thougts I decided to build the agc amplifier gasboss775 provided for me and make it into a small module with offsets and some leds to tell me what the amplitude of the output signal is. I added a compressor, and now it starts to sound like a vocoder.. The only thing is that due to the add of an external 16 bit ADC the sample time takes to long, well, not the sampling time but the conversion to usable data. In the demo I use a text to speech page reading a page from the Harry Potter books and a Solina module. If you are compressing the audio prior to sampling I think the built in ADC should be adequate. Good to see you're still pursuing this one, despite canine interruptions! from top lef to top right: An Arduino Nano, below the nano a dc/dc converter for -5 volt that is needed for the filters (this was before I desided to go Euro format) next to the Nano an AD8804 trimdac, above the trimdac a quad opamp, now a LM324 but this will be exchanged for a better rail to rail quad opamp. Next are 4 max260 dual programmable filters. They are set for a division of 200 of the clock frequency. The most left filter is used as a low pass ánd as a band pass filter, the most right on is used as a band pass filter ánd a high pass filter, the other 6 filters are just bandpass filters, so I end up having 10 second order filters. The low row of chips are 8x ICM7555 in astable mode, they are used to set the center frequency of the filters, this way I am flexible to the use of bins, be it lin or oct.
That is a bloody compact vocoder thingie! To keep learning from mistakes: I just removed the DC/DC converter because it introduced a huge amount of noise which I couldn't get rid off. Also started working on the front board placing potmeters and connectors.